Inside Recess, Shelter In Place, and other times stuck inside. One of the challenges of a teacher is being in the classroom with 20+ wiggly little ones for too long. Somehow I missed my undergrad class when this issue was addressed. 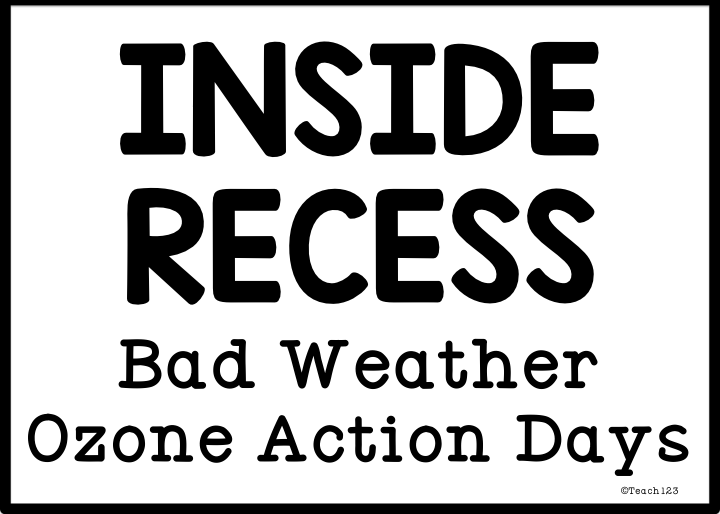 Sometimes the reason is weather, other times we couldn’t go outside because the “big kids” were taking a test and our noise on the playground would disturb them. At times we had to shelter in place because of a possible threat. Luckily, most of those were resolved very quickly. One of times we had to shelter in places, it was for an extended time. Boy! Did I feel unprepared, which was sad because at this point in my career I should have been more organized and prepared, at least it felt that way to me. After that experience and seeing my little ones reaction to it, I decided that I was going to have a few things in my classroom closet in case this ever happened again. I looked at this like my emergency substitute plans. Like car insurance, you hope you never need it. But, if you are ever in an accident, you are thankful you paid your premiums for the best policy possible. You know how hard it is to keep a class quiet on a normal day, then you factor in students who are hyped up after hearing the alarms and are asking you if bad guys are coming to get them. I’m supposed to take attendance, calm my students, and keep them quiet – I felt like I needed to morph into 3 people. I needed to email the office my attendance, tell them who was missing, and where those students were currently (reading specialist, speech, restroom, etc. so they could locate them) all while trying to keep 20+ wiggly anxious little ones quiet and email it. Oh ya, we had trouble logging on because we were all trying to do it at the same time. 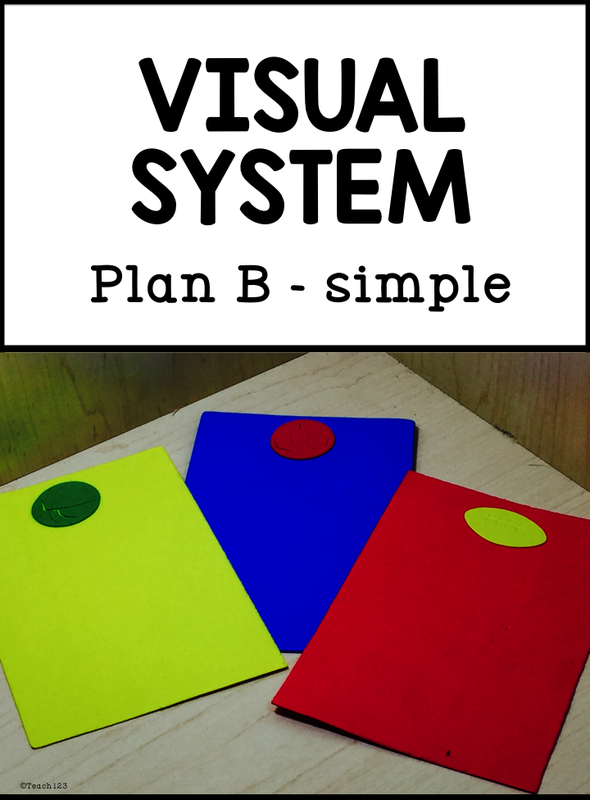 It would be nice if you have a Plan B in case your computer system is not cooperating. It could be something simple like the picture above. These are foam rectangles. As a school you could come up with a color code system such as blue. Blue is “cool”, I have all of my students. Red is “oh no my blood pressure is high” I have missing _ number of students, please locate them. Yellow is “caution – students are with resource teachers”. Even if you are in a closet, you could sit this outside the closet. Most administrators peek into your classroom windows. They could see something this big and colorful from far away. Or if a fireman or policeman was peeking into an outside window could also see it. First of all, it depends upon what type of shelter in place you are doing. Sometimes, you have to go into a very secure place like a closet or hallway, which is what my class was doing. The darkness alone was scaring some of them. I had a flashlight that I turned on, but I also wasn’t sure how much battery life I had either. I add batteries to my mental check list of what to buy in the very near future when this was going on. Do you see the candle in the picture above? It is a really neat fake candle from the Dollar Tree. It turns different colors. I think students would be mesmerized by it. You might want to look at after Christmas sales to see if you can find a better quality one to put in your kit if you plan to make one. This one is pretty flimsy. I like it, but I think there might be a few issues with storing it, though. I recommend turning it on when you take attendance. It should keep them entertained. 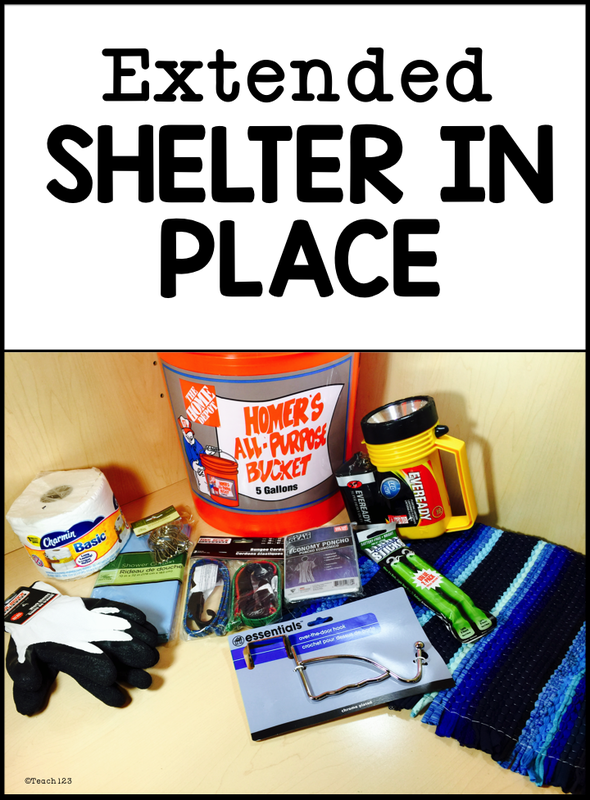 I would recommend doing a few of these activities once or twice before you ever (hopefully never) have a shelter in place so your students know the procedures. Remember, these are SILENT activities. Stress that, practice it over and over. These can only be done in complete SILENCE. Monkey See Monkey Do: Hold up the monkey. This is played like Simon Says only it is Monkey See Monkey Do. Even if you are in small area you can hold up two fingers, touch your pointing finger to your left earlobe, etc. Students have to watch and be silent. If you have a larger area you can do more involved activities. This is a fun activity for getting the wiggles out, just remind them it is a silent activity. Pass it: I like to use the ball you use in the pools because they are quiet and don’t bounce. There is a yellow one in the picture above. This works if you are in a larger area. Best if you can have your class sit in a circle. One person sits in the middle. That person hands the ball to someone in the circle. The person in the middle will hold up a number of fingers and point to right or left. Students will pass the ball in that direction to that many students. Example: Jake is in the middle. Jake holds up 4 fingers and points to the left. Zena has the ball. She hands the ball to Drew who hands it to Heather who hands it to Anna who hands it to Theo. It is kind of like moving your piece on a gameboard. Students will sit for this game and it gets their mind off of why they can’t leave the room. Foam Tongue Depressors: These are a great open ended activities. Make pictures, designs, and best of all they are quiet. 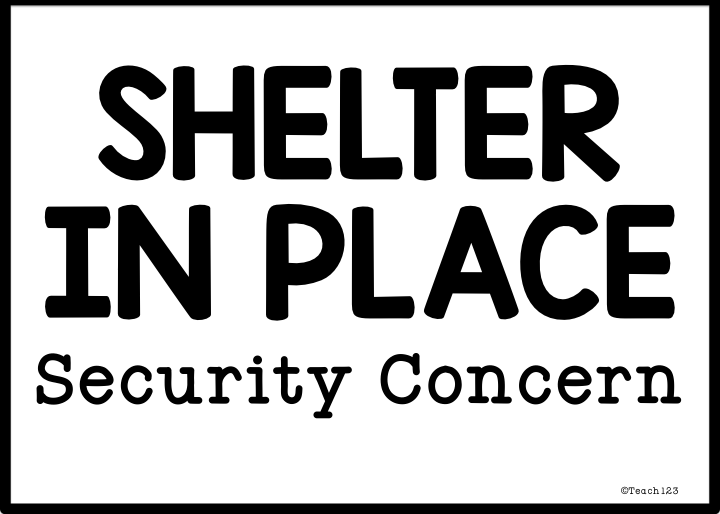 The less restrictive shelter in places are easier, but the biggest hassle of this one is the restroom. Very few teachers are fortunate enough to have a restroom in the classroom. The anxiety of being told you can’t leave the classroom means students suddenly HAVE to go to the restroom or they swear they are going to have an accident. 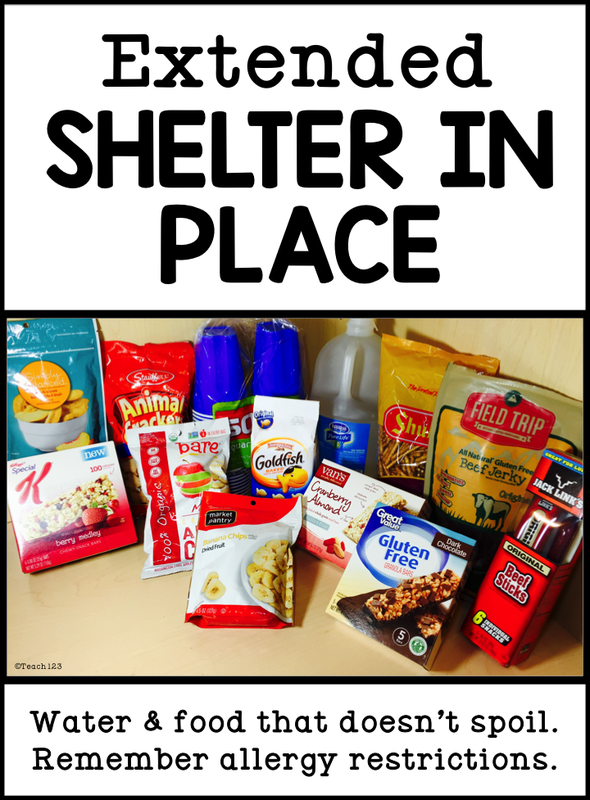 Not that this is what you want to do, but if you are in an emergency situation you might be thankful that you had the supplies above. You can make a temporary restroom with a Home Depot bucket and hang a shower curtain for privacy if you don’t have a large enough closet for privacy. Sit it on a rug. Add toilet paper and hand sanitizer. Once again, not perfect but better than students soiling themselves. Many of these foods are easy to store and will last quite a while. 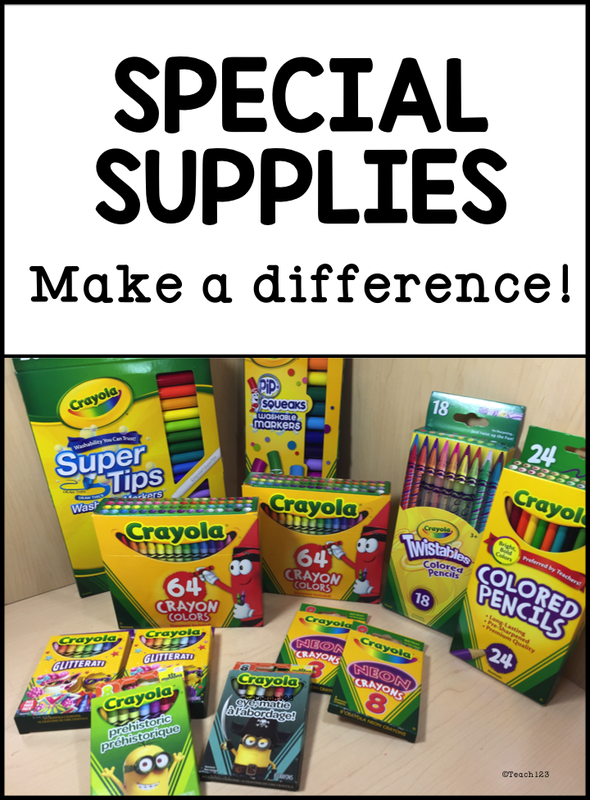 I’m sure your parents help with supplies if you are interested in making some type of emergency kit. There are days when you have to stay inside due to bad whether or bad air days. I think some places call these ozone action days. One of the things I have found that helps on these days is to keep special supplies in my closet. I bring out these very special supplies from time-to-time. I don’t bring them out every time we have an inside recess. I wait until my students are having a particularly jumpy, wiggly day. Then I bring out my special supplies and put on some soothing music. 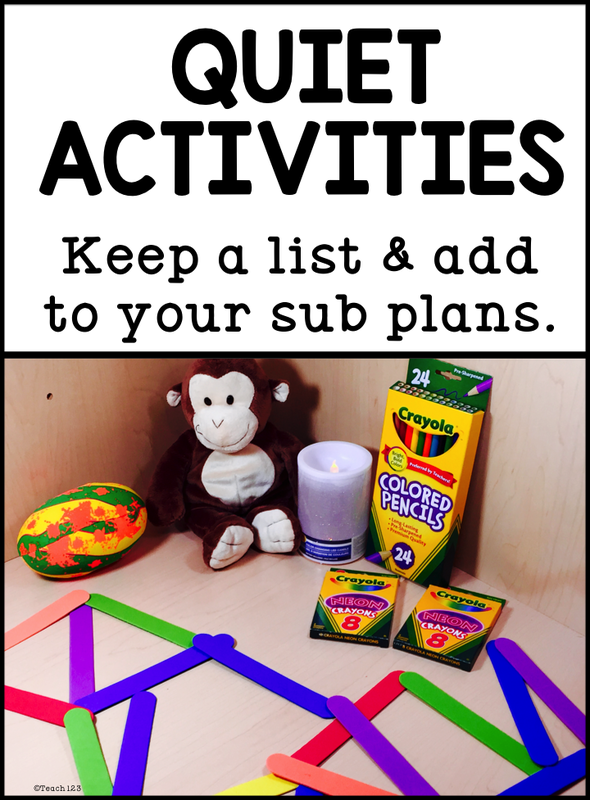 I use a variety of activities with my students. Sometimes I have them close their eyes and make pictures in their mind when they listen to classical music. Then they open their eyes and draw what they saw in their mind. 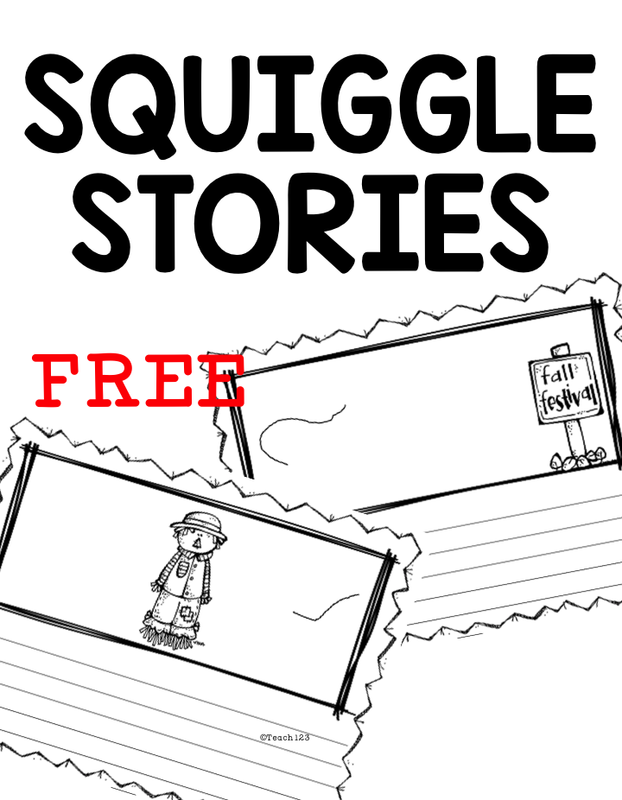 My students love squiggle stories. Have you tried them? I have some free ones that your students might enjoy. 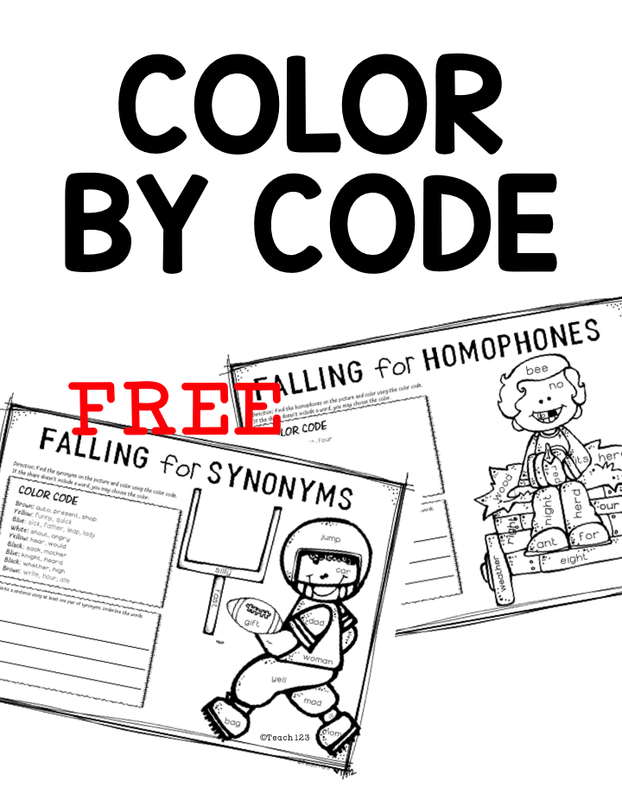 Color by code is another activity that I use for inside recess days. When I use my special supplies, I an count on quality work and busy bees. I have a couple of freebies for your next rainy day. 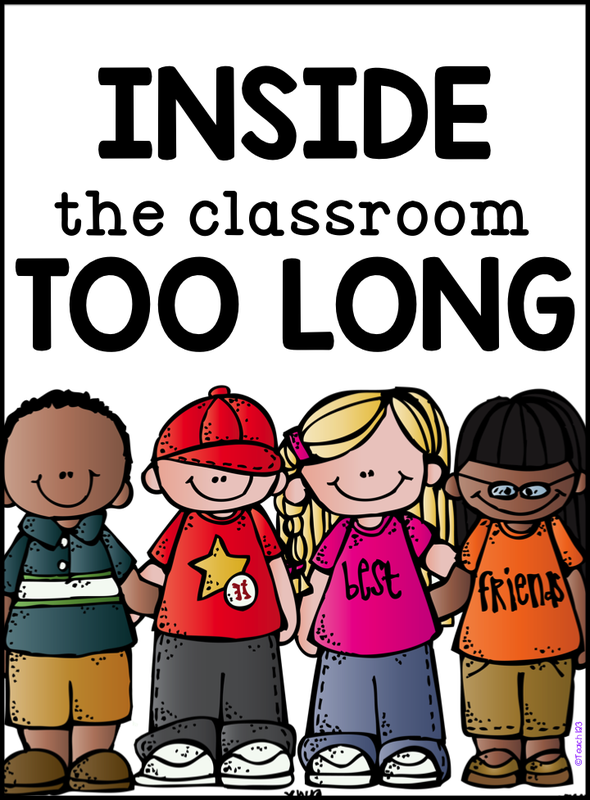 Do you have any tips that you have found that makes being in a classroom too long less stressful? Great ideas! Fortunately I have a bathroom in my classroom. The idea of the bucket grosses me out, but can see how it might be necessary.